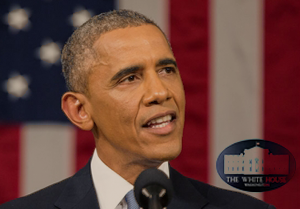 President Barack Obama issues an executive order that calls on federal government agencies to promote competition within uncompetitive markets. President Barack Obama launched a broad new initiative today, issued through an Executive Order, that calls on departments and agencies of the Federal government to take measures to recognize uncompetitive markets and promote competition within them through executive actions. The announcement, accompanied by a 17-page brief by the White House Council of Economic Advisers (CEA) detailing a decline in competition in numerous sectors within the American economy, ordered the relevant government agencies to report back within 60 days with a list of specific areas where they can promote competition, the steps they can take, and when they intend to do so. The White House announcement was accompanied by a 17-page issue brief, prepared by the CEA, the agency that advises the President on economic policy, on the benefits of competition. 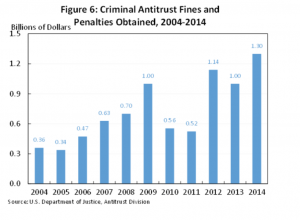 The brief acknowledges that the American economy has become less competitive and more concentrated in recent decades, and suggests that robust enforcement of antitrust laws can serve to mitigate this problem. The CEA relies on a large number of academic studies to argue that competition benefits consumers and workers, and that firms’ abuse of monopoly power may harm workers and consumers alike, by leading to overpricing, lower quality, and lower wages. “The presence of many firms in a market does not ensure competition. Under certain conditions, firms may be able to collude with each other to create and abuse market power, for example by agreeing to raise prices or by restricting output (thereby raising prices) to consumers or by restricting wage growth for workers,” the Council writes, noting that in the United States price-fixing is illegal and that the detection and prosecution of “collusive cartels” is and should be an important priority of antitrust agencies. 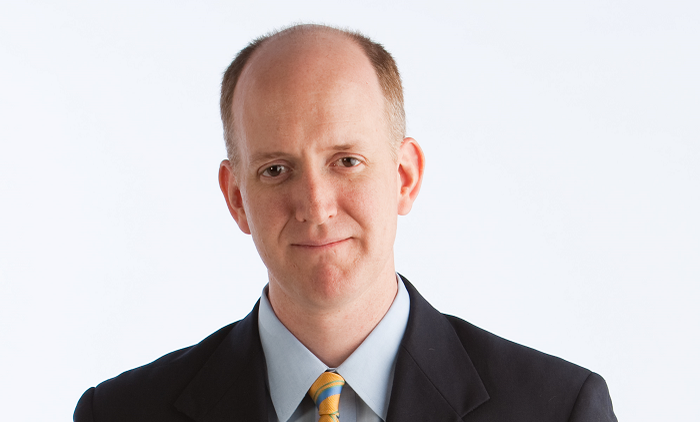 The President’s economic advisers didn’t stop at outlining the benefits of competition. The CEA goes on to diagnose one of the major ailments affecting the American economy today: in parts of the economy, at least, competition appears to be declining. 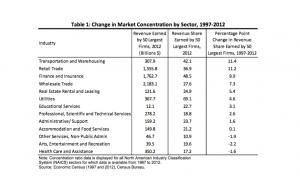 The paper connects this decline in competition to three main trends: increasing industry concentration, increasing rents accruing to a few firms, and lower levels of firm entry and labor market mobility. In the majority of industries surveyed by the Census Bureau, the period of 1997-2012 has seen increases in the share of revenue obtained by the 50 largest firms. Other industry-specific studies, the CEA brief notes, have found similar results over longer period of time. 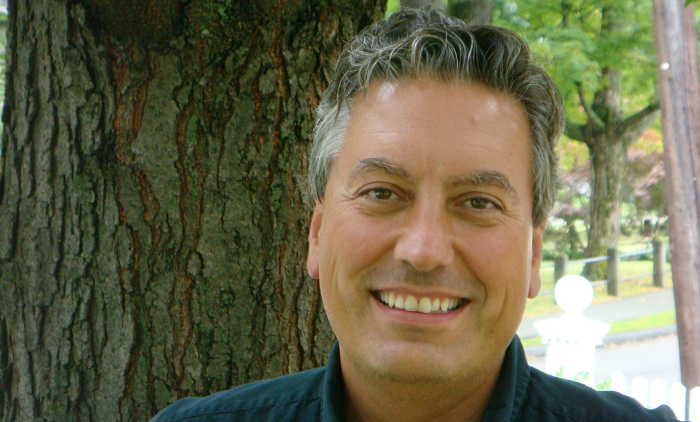 Dean Corbae and Pablo D’Erasmo (2013), for instance, found that the share of the ten largest banks in the U.S. in the national loan market increased from about 30 percent in 1980 to about 50 percent in 2010. Their share in the deposit market increased from 20 percent to 50 percent during the same period. The CEA cautions that this data “is neither a necessary nor sufficient condition to indicate an increase in market power.” Instead, it notes, “antitrust authorities direct their attention to concentration at the relevant market level for each product or service,” but that type of data only exists in a few industries, where increasing market-level concentration can be found. The average Herfindahl-Hirschman Index (HHI)—a commonly accepted measure of market concentration—for hospital markets, for example, increased to a level associated with just three equal-sized competitors per market, according to a 2015 study by Martin Gaynor, Kate Ho, and Robert Town. Similar increases in the average HHI have been documented in the market for wireless providers, and the railroad market. Another troubling trend is that the gap between the most successful firms and the median firm has grown tremendously over the last two decades. 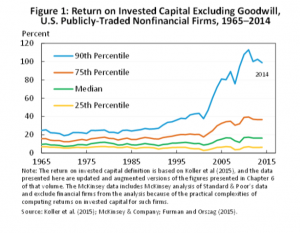 The table below, showing the returns on invested capital for public non-financial firms, demonstrates the effect of concentration: firms at the 90th percentile are seeing returns on investments that are “more than five times the median.” Twenty five years ago that figure was closer to two. The CEA also spotlights evidence of a decline in labor-market dynamism—the frequency with which workers move from one job to another—and in the number of new firms each year. 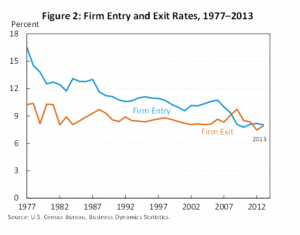 The Census Bureau’s Business Dynamics Statistics for 1977-2013 indicate that the rate of new firms entering markets have declined over time, whereas the rate at which firms exist markets remained pretty steady. The links between these factors, the CEA cautions, are not clear. “On the one hand, it could be that a decrease in firm entry is leading to higher levels of concentration, which leads to higher rents. On the other hand, it could be that higher levels of concentration are providing advantages to incumbents which are then used to raise entry barriers, leading to lower entry. Or it might be that some other factor is driving these trends. 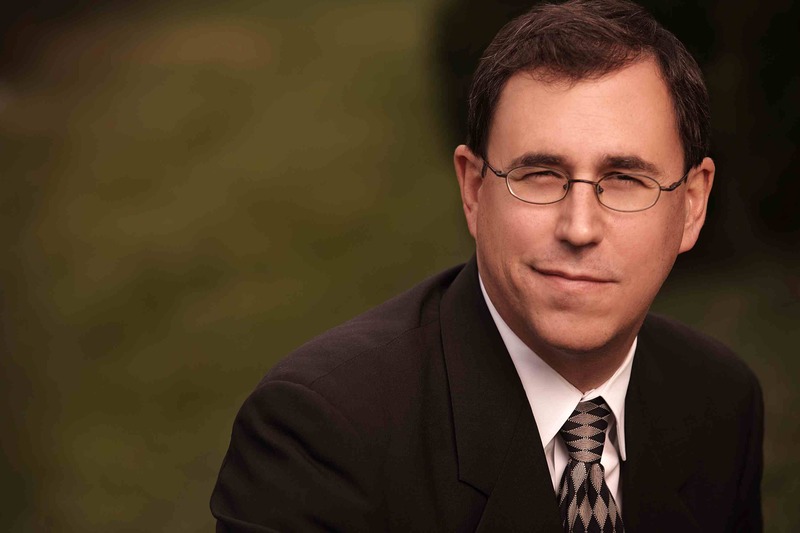 For example, innovation by a handful of firms in winner-take-all markets could give them a dominant market position in a very profitable market that could be difficult to challenge, discouraging entry.” Nevertheless, it concludes, these trends point out to a decrease in competition that may require attention from policymakers and regulators. The CEA focuses on a number of possible reasons for the apparent increase in concentration, including deliberate anti-competitive behavior by corporations, such as “price-fixing, bid-rigging, and market-allocation agreements,” and a rise in M&A activity. The past few years have seen a sharp increase in the value of reported M&A deals. Global mergers and acquisitions topped $5 trillion in 2015, with $2.5 trillion of this activity located in the U.S. Deals surpassing $10 billion accounted for 37 percent of the global total, almost double the five-year average of 21 percent. While the value of mergers and acquisitions has spiked in recent years, the number of transactions reported to antitrust authorities has been more or less flat over the past decade. That is partly because while the number of mergers remained relatively stable, each merger on average is much bigger nowadays, involving firms with bigger market shares. The number of investigations launched by antitrust authorities to determine whether a merger is likely to harm competition has been relatively stable as well. When it comes to anti-competitive behavior by firms, one possible solution is tough enforcement of antitrust laws. The CEA details a number of avenues by which regulators and policymakers can challenge and curb anti-competitive behavior. 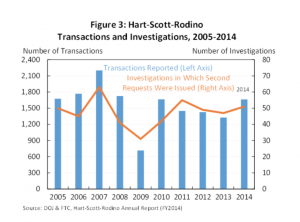 Also, it observes an increase in enforcement in recent year. 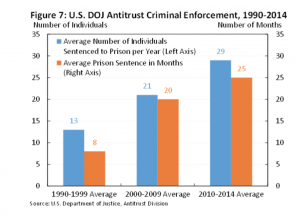 In addition, the CEA details a rise in the number of prison sentences for antitrust violations, and in the length of prison sentences: “Since 2010, the average number of individuals sentenced to prison each year for criminal antitrust violations has increased 38 percent and the average sentence has increased from 20 months in 2000-2009 to 25 months in 2010-2014.” The average number of individuals sentenced to jail has also increased, from 21 in the decade of 2000-2010 to 29 in 2010-2014. “Over time, these enhanced criminal enforcement activities could have a deterrent effect,” CEA members conclude. The CEA goes on to list a number of ways in which government agencies can engage in “sector-specific regulation and rule-making” in order to promote market competition. Examples include the Department of Transportation’s efforts to divest airlines of certain flight “slots” in favor of new competitors, the FCC’s enforcement of net neutrality that prevented broadband providers from being able to abuse their market power, and the FCC’s actions to allow cell-phone unlocking. Further study of the anti-competitive effects of common ownership is warranted given that many U.S. industries are oligopolies and that the role of institutional investors has grown over the last 30 years,” the CEA notes. “What We Have is Capture of the Regulators’ Minds, A Much More Sophisticated Form of Capture Than Putting Money in Their Pockets” Horizontal Shareholding, Antitrust, Growth and Inequality Is More Antitrust the Answer to Rising Wealth Inequality? « Does a CEO Have a Duty to Lobby?